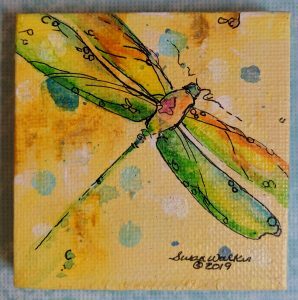 Original dragonfly mixed media painting by Susan Walker Art. 2×2″ stretched canvas. Comes with an easel for displaying or ready to hang. Categories: Home Decor, Original Artwork Tags: dragonfly, miniature painting, stealth, Susan Walker art Mixed Media, unique gift. This miniature painting was inspire by the amazing insect world. The dragonfly is an amazing creature. It has the ability to grab prey right out if the air as well as fly backwards! I think of their delicate beauty. “Thinner than paper” wings and oil like colors. Enjoy this 2×2 ” painting to bring joy to a spot in your home,office or as a gift.